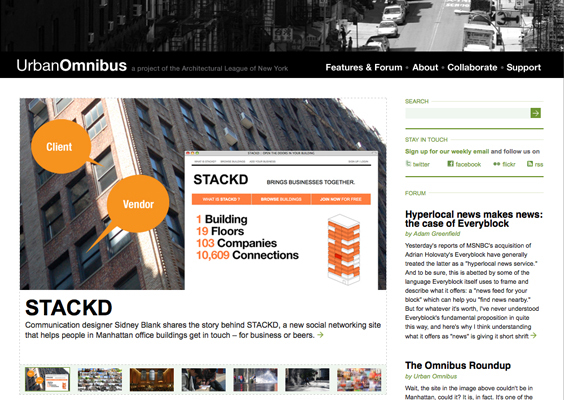 I’m proud to announce that STACKD is featured in an online publication called Urban Omnibus that intends to “increase understanding of the city we have and encourage ideas that can lead to a more inclusive, more sustainable, more beautiful city that could be.” We’ve worked hard in getting some of the kinks out of the system in time for the article’s publication and are keeping our fingers crossed that people will sign up and start using STACKD to build relationships with others in their building – or nearby. The article gives a bit of conceptual urban theory background to the project, how we originated the idea as a way to meet other businesses and where we think it could lead. Please let us know what you think, even the bad stuff! Awesome concept. Was bought to our attention as a potential tool in b2b planning consultations and travel planning. From car-pooling to enabling urban planners to directly engage with the most relevant stakeholders prior to project developments. Be great to see some sort of check-box where individuals and business could register interest in being approached for anything from beers to trip planning. Thanks for your comments Stacey, we are pretty proud of the idea too and now we have to actually make it work well!